Summer Break is in full swing and we're already working our way through our Summer Bucket List! 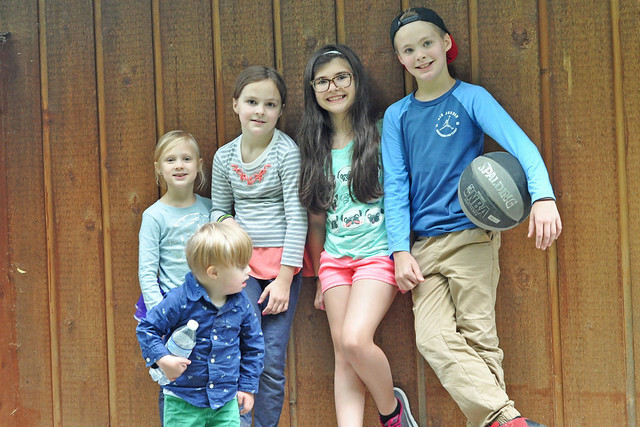 I have my 4 kids at home, plus my great niece is with us each weekday. Every Thursday I also watch my best friend's two boys. It really does feel like I'm running a day camp! 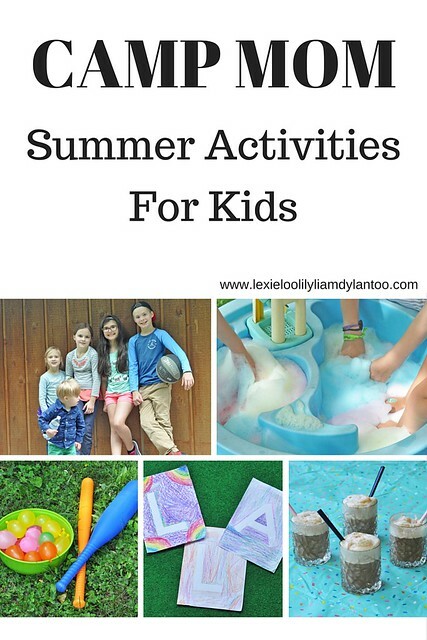 To prepare for a fun (and busy) Summer, I created a calendar full of activities to do with the kids. I scheduled something fun for each weekday. 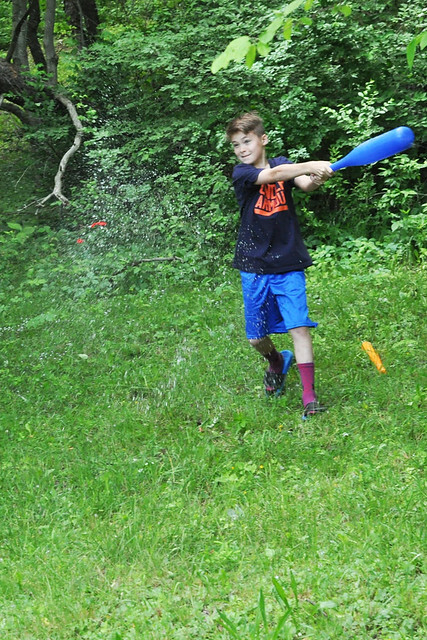 Although I might switch the activities around each week depending on the weather, the formula is the same: 1 craft, 1 recipe, 1 outing, 1 sensory or learning activity and 1 outdoor game. To prep for the week, I check my calendar and make sure I have all the items needed for those activities. In addition to what I scheduled, there will also be regular Storytime and Summer Reading programs at our local library and lots of playdates! The first week of Camp Mom was a huge success! I plan to share those ideas every Tuesday throughout the Summer! 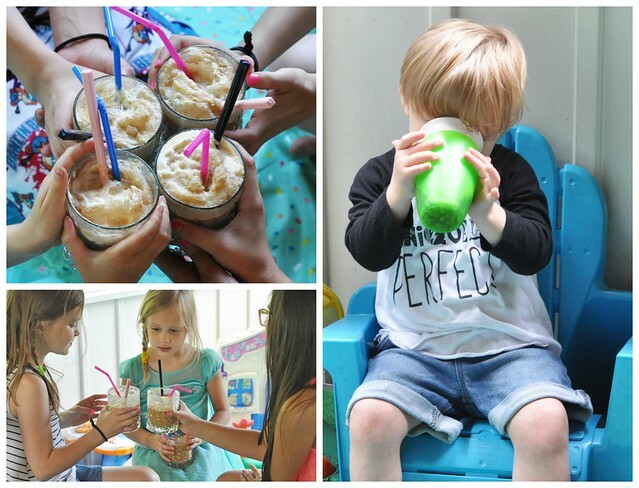 We toasted the first day of Summer Break with good old fashioned Rootbeer Floats! There isn't anything special about this recipe! It's just 2 scoops of homestyle vanilla ice cream topped with rootbeer. I told the kids how to make them and I let them do all the work. They ended up adding some chocolate sprinkles on a whim after they started drinking them and they said that the sprinkles make them so much better! 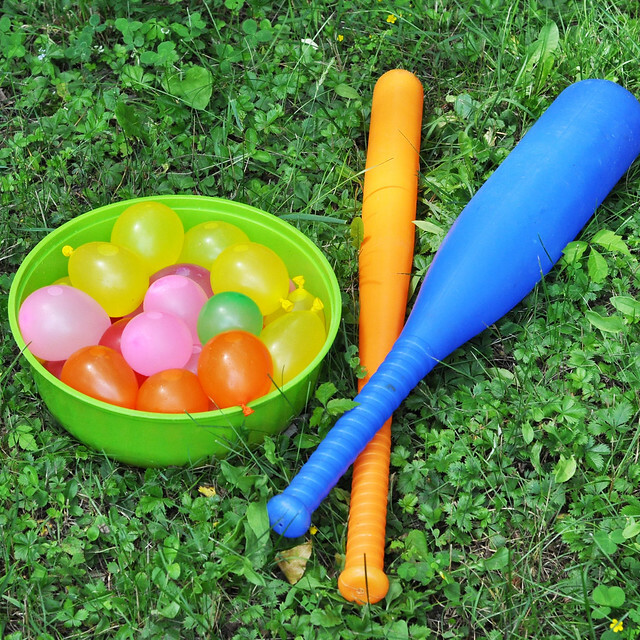 Due to the fact that I had enough kids at my house for a baseball team on day three, we decided to play water balloon baseball! This was a hit and they ended up playing it several times over the past week! 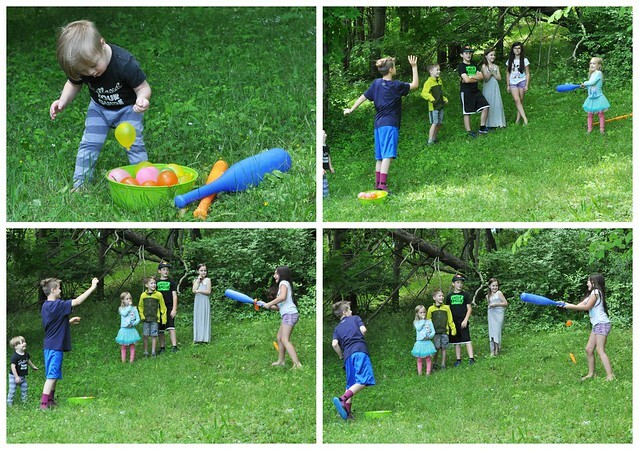 The kids loved this activity so much and it was definitely fun to watch! On day four, we made a simple craft that doubled as a keepsake! 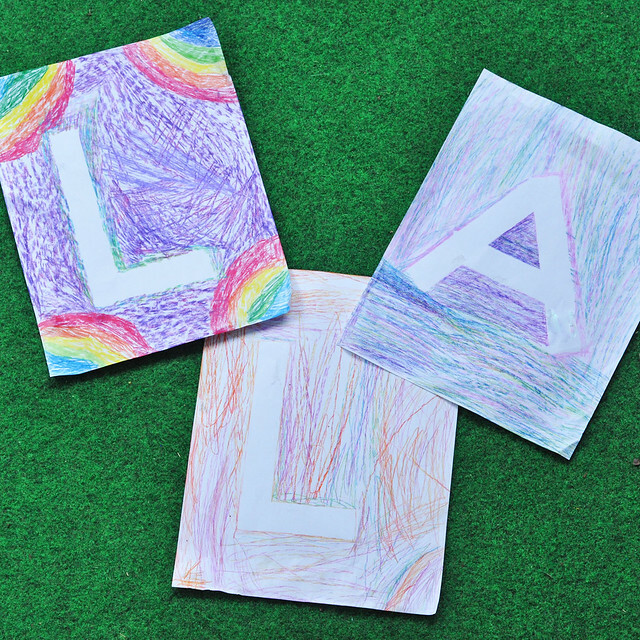 This is an easy craft for kids of all ages. 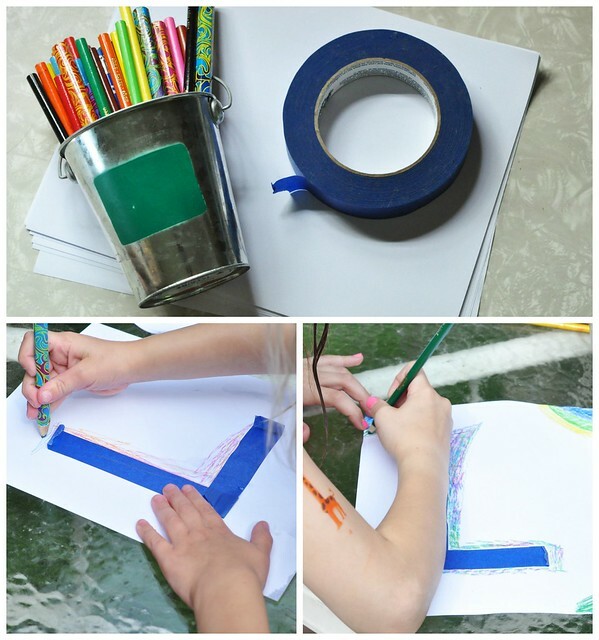 Have each child form their initial on a piece of paper or a canvas with painters tape. Color the entire canvas, then peel off the painter's tape! 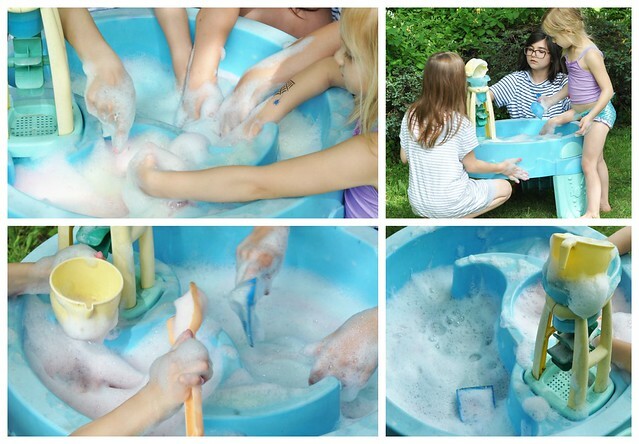 Cotton Candy Soap Foam is an easy and fun outdoor sensory activity! Decide how many different colors you want to use, then make a batch of soap foam in each bowl. Pour 1/2 cup of bubble bath and 1 cup of water into each bowl. Add a few drops of food coloring to each batch. I chose neon food coloring in order to make the foam cotton candy colored. Now mix each batch with a hand mixer on medium speed until it forms into a lot of foam. It took me 1-1 1/2 minutes per batch. I made four separate batches of soap foam in four separate bowls, then dumped each bowl into the water table. Enjoy! 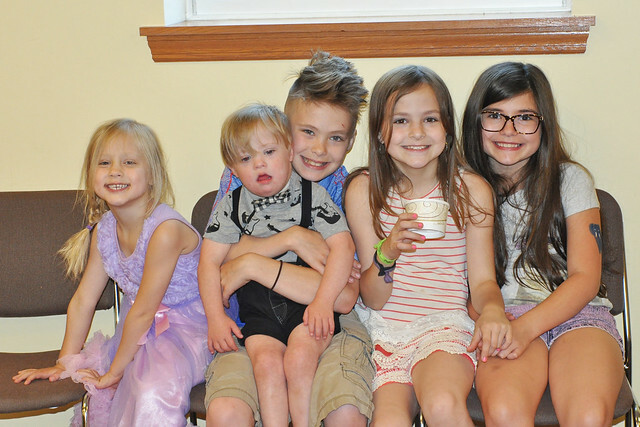 We ended Camp Mom Week One with an Ice Cream Social at the Library to kick off the Summer Reading Program! 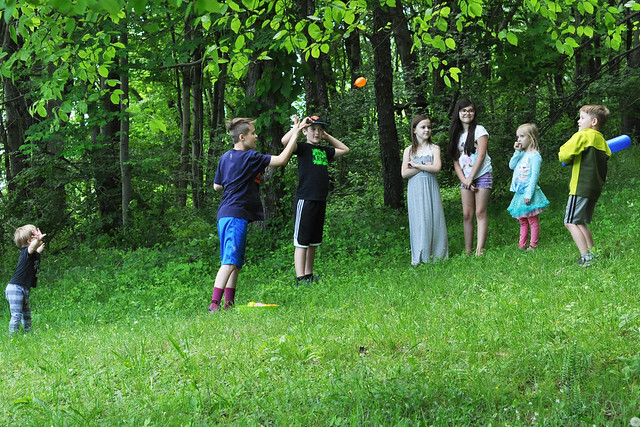 Camp Mom is off to a great start and we have so many fun activities ahead of us! My goodness that was one fun week. I love all of the photos from the baseball game. Looks like a blast. :) can't wait to hear how this week goes. Thank you! I hope this keeps the kids busy all Summer! So much fun! I am so happy you are going to share your ideas with us so I can copy you, making me half as cool :). I did Grammie Camp last week and to see this melts my heart. I love it. I do hope you'll join me back on Thursday for Party at My Place for my all things summer theme. Thanks for linking on Tuesday Talk this morning. That is awesome! Your grandkids are so lucky to have you. Thank you for reminding me. I will be sure to link up a post on Thursday! So fun! I had plans to put together a summer bucket list, but I've yet to do so! I better get on it! I always have plans to make a bucket list and I never actually post it. I'm hoping that the calendar I made holds me accountable for posting! So fun! I love having things planned for them because I find it helps our day go by a lot smoother. I completely agree. Even if it's just something little it still helps! I love this so much! You are such an awesome fun mom! I'm for sure going to borrow some of your ideas!! Thanks so much for sharing! Thank you so much, Kendra! I like easy ideas. The easier the better...haha! Fun ideas! I love your root beer float glasses. Very Mad Men-ish. I am going to add the cotton candy foam to our to do list next week. Have you made Cloud Dough? We made it over spring break and it was a huge hit with my littles. It's just flour and baby oil. Have a great week! Oooo, are you a Mad Men fan? I miss that show! I hope your kids enjoy the foam. It lasts surprisingly long! We have made cloud dough before. Lily loves it! Holy moly, Stefanie!! You have SEVEN kids on Thursdays?? That is pure insanity! Haha. All of these ideas are great. 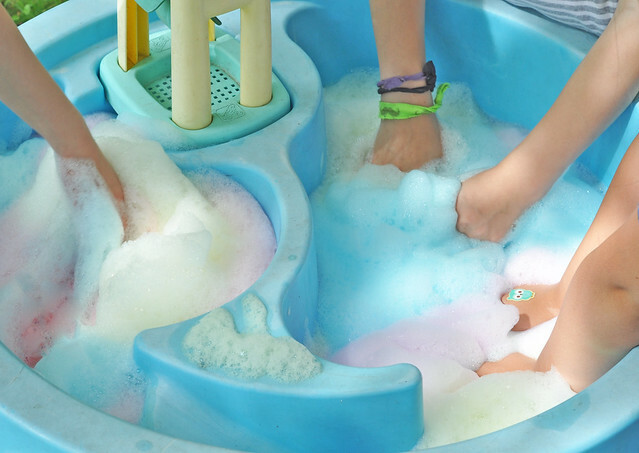 I especially love the cotton candy soap foam idea... my babies would love this! It is insane, right?!? My husband likes to tell me that frequently. But once you have 4 kids, I swear you barely notice any more! You should definitely make the soap foam. It only takes a few minutes to make and my kids had a lot of fun with it! Umm.... wow!!! You are amazing!! I am loving all the fun activities.... and it is now clear that I need a water table!! 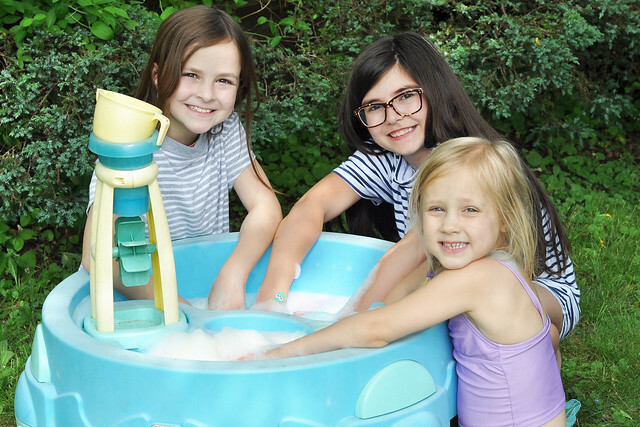 You absolutely do need a water table! We use ours year round! 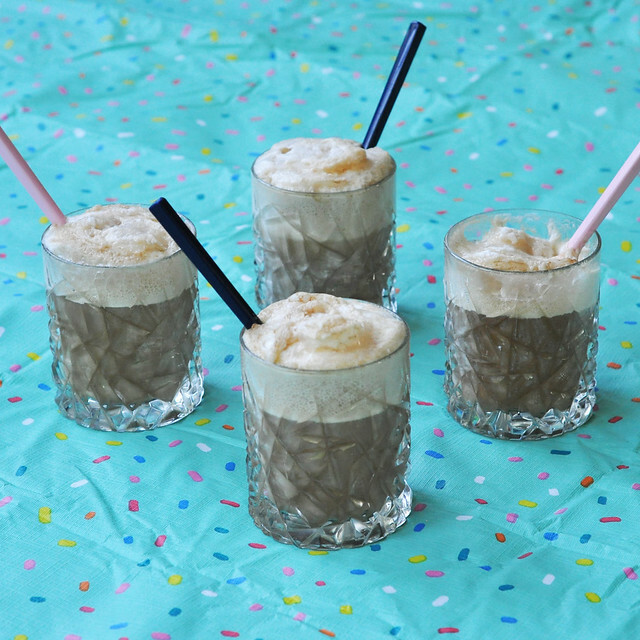 Nothing says summer like root beer floats! You guys are off to a great start! I agree! Heck, I would love to have one each day! Oh so fun! I love the bubbles in the water table!! The kids really enjoyed that one! The two older girls played the most! Great ideas! You are such a fun mom! Awww, thank you, Leslie! XOXO You should come over to play! Lots of caffeine, my friend! Haha! It's great to see you embrace messy fun! Some parents are too afraid to go there and their kids miss out. 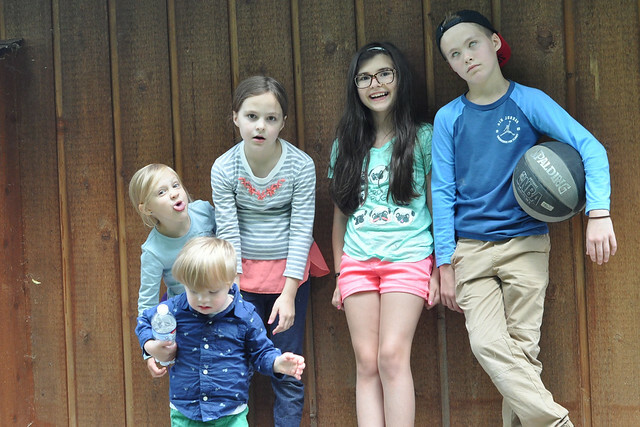 We have cousins over today for a sleepover. 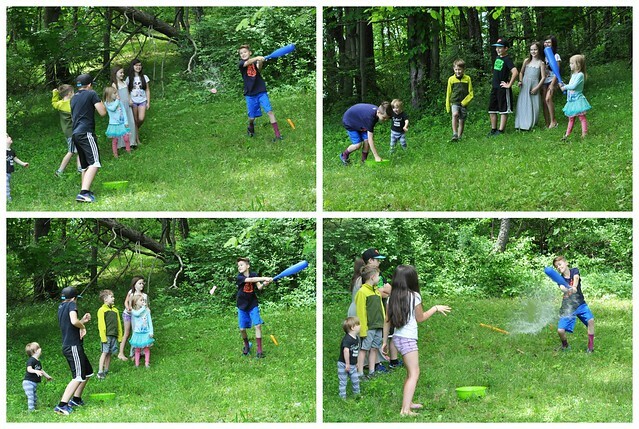 The children had a big water fight in the garden and they absolutely loved it! Now they're all quietly crafting away in the kitchen...I might get 5 minutes with a cuppa and a book:) Love your Blog, lovely family: well done!